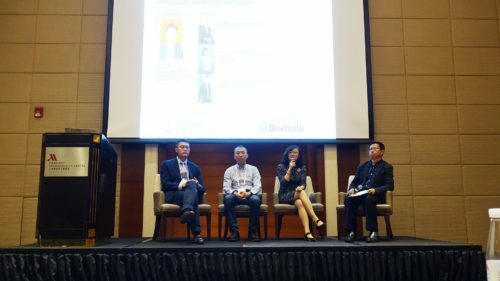 23rd Asia IoT Business Platform was held successfully in Shanghai at Marriot Shanghai City Centre on May 9-10. Mr. Ye Xiaohua, the secretary of party branch from Shanghai Internet of Things Industry Association gave the keynote speech on China IoT opportunities. Secretary Ye updated the IoT achievements and progresses China has made on 2017. Obviously, 2017 is a remarkable year for China IoT industry. What is more certain is that there will be more opportunities for IoT industry in 2018. Ms. Huang Xuan, the General Manager of China Unicom Shanghai IoT operation centre, Mr. Zhu Ming, the Deputy General Manager of China Telecom IoT Branch and Mr. Kevin Pang, Head of Strategic Engagement China from GSMA joined the keynote panel discussion together with Secretary Ye. As the moderator, Secretary Ye asked the panellists questions on three aspects: 1. Advantageous fields; 2. Updates on NB-IoT and 5G deployment; 3. Main challenges of developing IoT. “After the LPWAN technologies came to the version of public, all three telcos start to put the IoT development to the first place,” Kevin Pang mentioned in the panel discussion, “IoT connectivity of 3 Chinese telcos accounts for 45% of global telcos IoT connectivity”. “China Telecom plans to increase 40 million NB-IoT connectivity in 2018”, Mr. Zhu Ming said. Meanwhile, Ms. Huang Xuan also disclosed that China Unicom has made the NB-IoT national deployment plan and will release their detailed plan on 17th May, the World Telecommunications Day. Undoubtedly, China has come to the front rank now with three telcos rapidly developing NB-IoT. However, the IoT industry players have to face the challenges that we still can’t uniform the standards of different application scenarios, which was mentioned during the discussion several times. But I do believe this problem will be well solved if the telcos can work closely with the vertical industry clients. In the session 2: IoT opportunities in One Belt One Road, Mr. Chng Ken Wei from Infocomm Media Development Authority of Singapore, Dr. Sumavasee Salasuk from Digital Economy Promotion Agency (Thailand) and Dr. Karl Ng from Malaysia Digital Economy Corporation(Malaysia) separately introduced the digital economy development status in their countries. Even the countries are at different stages of IoT development, they all expressed the intention to collaborate with more and more Chinese excellent enterprise on digitalization and IoT. To response “One Belt One Road” initiative of China, we hope to witness the cooperation in IoT area between Chinese enterprises and ASEAN governments. Interesting case studies on Industrial IoT shared by ADLINK, Haier Group, Japan IVI and Irootech, attracted the attendees from different industries in the afternoon. As the manufacturing power in the world, China has a very big and promising market of Industrial IoT and smart manufacturing. Many manufacturers have started their new road of “Smart Manufacturing”. However, there are quite a lot of industrial enterprises haven’t realized the necessity of digital transformation. I'm deeply impressed with the presentation from Mr. Zake Lin, the Product Manager, Connected Factory Centre, IoT Solutions Technology Business Unit from ADLINK. No matter the "Connected Factory" or "Factories of Future", Mr. Zake show how ADLINK can help the factory realize the digitalization with their solutions and products (DEX-100). Mr. Wang Jun, the Regional General Manager of Irootech mentioned during his speech:” All manufacturers who want to realize the digital transformation have to do three things: 1. Improve product competitiveness with IoT technologies; 2. Innovate business service mode; 3. Reduce cost by perceiving the data collected from clients”. Mr. Sam Wu, the General Manager of Cloud Services from Haier Group, introduced the successful transformation of Haier from traditional home appliance manufacturer to IIoT solution provider, which is a really good example for every manufacturer and enterprise. Coincidentally, ZPMC has done the same transformation as Haier Group. Famous as the world biggest port heavy industry manufacture, ZPMC now is more than a heavy industry manufacture but also a service provider in automated port area. The intelligent diagnosis and maintenance system of port equipment has become their new advantage to keep a foothold at IoT industry. Dr. Ng Poh Khai, the Innovation Leader & Senior Manager, Asia Pacific Innovation Center from DHL Group sharing their experience on leveraging IoT technologies for more agile supply chain management. Dr. Poh Khai also shared a video about their successful cooperation case with Huawei on smart logistics. With e-commerce rapidly developing in China, I think the logistic industry will inevitably be affected by IoT technologies in short time and smart logistic solution provider like Ayla Networks will have more and more business opportunities. Mr. Wang Yi from Fudan University Shanghai Cancer Centre shared their interesting “smart hospital” program at the healthcare session. “Even we started to plan the smart hospital project very early but the progress so far is very slow”, Mr. Wang said, after listening to the case study of IoT adoption in other industries. Healthcare is always a topic which is widely concerned by government and public. Therefore, I believe that healthcare will become a market where the IoT leaders will compete in. Witium Intelligent System, Knowyou Technology and Esim Technology separately shared the SaaS application in IIoT, IoT network quality testing and RFID technology application at last session. With IoT eventually coming into public version, different IoT technology vendors should have a clear role orientation of themselves, which will help them more quickly and accurately find their target customers. As the organizer, we do hope to hear more and more case studies from different IoT technology providers in future events. If you are interested to learn more details about both panel discussion or other topics presented at the conference, please leave a comment below or email me at vincent@industry-platform.com.